Are you finally going to meet the family of your beloved and don’t want to forget to bring a little cake to share? Simply highlight the text in the mail, press Ctrl + C or right click -> Copy and click.to Memonic the invitation is immediately saved as a note, and as an example, also synchronized with your smartphone. 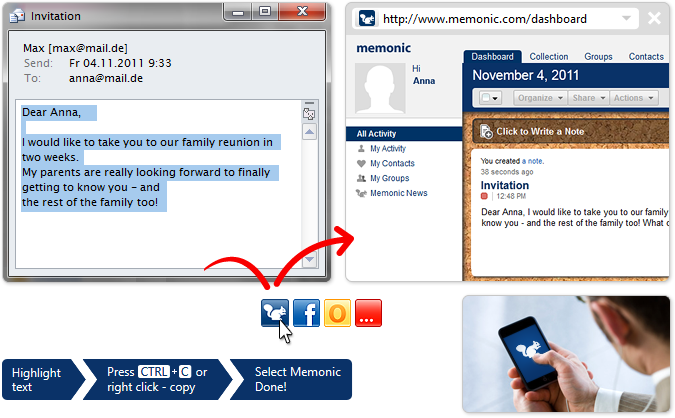 Since Memonic constantly synchronizes your notes with your Memonic account, the to-do-list is now available everywhere. If you have Memonic installed on your Smartphone, you can always view your notes when you’re on the go.